Hidden away in the part of the Midcoast that leaves natives as speechless as visitors, the pristine beauty, quiet solitude and stunning waterfront defines Sea Heather Cottage. Named for the hearty yet delicate flower that grows in the salty crags of the Maine coast line, this comfortable and cozy cottage is a perfect retreat for those who want to get away without completely unplugging. Nestled on Broad Cove -the epitome of unspoiled Maine – Sea Heather’s privacy is abundant and the stars at night will be the brightest you’ve seen thanks to the virtual lack of artificial light. In this midst of all this, it is hard to remember that town is just 15 minutes away but it most certainly is. 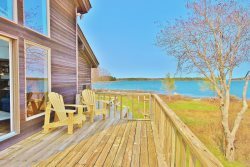 Sea Heather is situated on 2.5 acres of wooded land and hundreds upon hundreds of waterfront offering views from 3 sides of the property. The cottage has a large lawn and wooded paths leading to sun drenched rocks and the salty, ever-changing Broad Cove bay. See Bald Eagles and Ospreys dive for fish and seals bask in the sun by the dozens. Chairs situated at the water’s edge offer a shady place to read, observe and relax. Kayaking and swimming is optimal here for those who are comfortable navigating changing waterways and those who are mindful of tides. Peter’s Pond – a fresh water swimming hole – is about a mile away and the well maintained trails of the Medomak Valley Land Trust are also close by. This is an outdoor enthusiast’s paradise! The cottage is charming, sunny and bright and uncomplicated. There are two bedrooms and 1 bathroom, a living room, a full kitchen and an eating nook. The best spot in the house is the front deck – shaded my large, mature trees this is a place to enjoy coffee in the morning or a casual dinner as the sun sinks behind the horizon. There is an outdoor dining area here with seating for 4-6 people. The kitchen is fully equipped with a full sized electric stove and refrigerator, dishwasher, microwave and coffee maker and toaster. Off the kitchen is an adorable, sunny eating nook, with banquet seating, that can seat up to 7 people. The master bedroom has vaulted ceilings, views of the water and direct access to the deck. This bedroom has a double bed. The second bedroom has two twin beds and is on the other side of the cottage from the master bedroom. It also has views of the water. The cottage’s bathroom is full with a standup shower. The living room overlooks the deck and the waterfront thanks to a virtual wall of windows – there is plenty of comfortable seating, great light for reading and a flat screen television with satellite connection. This property is fully connected with WiFi Internet connection for those who need access to email, etc.